This graphic organizer is meant for students to identify both imagery and its effect in chapter 2. Once students locate both, they are asked to analyze Fitzgerald's purpose using their observations and insights. 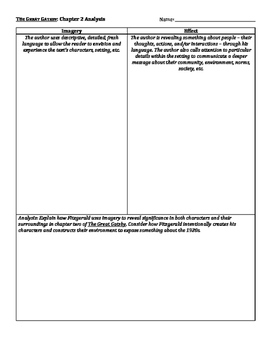 This is a great way to begin analysis of an author's intentional choices in language and character development. A Rhetorical Precis is a great way to follow up -- check out the related post for this assignment.